I do love Mexican food, taco salads and chopped salads. So yesterday I combined all of my favorites into an excellent Big Beautiful Chopped Taco Salad. It was spicy, crunchy, filling and yes – even healthy! My tastebuds were happy, my tummy was full and I took delight in knowing that I fed myself a nourishing meal. Healthy can taste delicious! The salad didn’t look this pretty once I mixed in all the ingredients and gave it a great big stir but it was so yummy! Here is where batch prepping my food comes in so handy to make my own “fast food” all week long. I took one of the batch prepped salads that I made up on Sunday and chopped it in my 15 inch Holland Bowl Mill beechwood bowl along with a handful of fresh cilantro. You can watch my salad prep video and read my blog post for all the details – Revised Batch Prep Salads. That is the base for my lunch salad every day! It gets in a ton of raw vegetables, is low calorie but super filling and highly nutritious. It can help you lose weight and keep it off! Since I already had corn on the cob cooked I took one and cut the corn off. A container of cooked oat groats was already in the freezer so I took some of that as well – maybe about a rounded 1/2 cup. I love oat groats used in a savory way – they lower LDL cholesterol and taste fabulous, Check out my video and blog post on How to Cook Oat Groats in the Instant Pot. The oat groats were warmed up in the mircowave oven along with the corn. 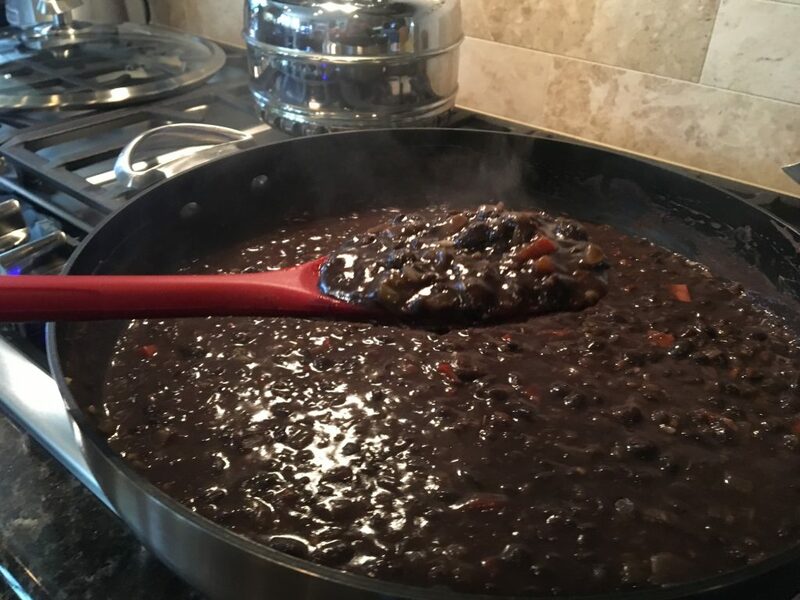 On Sunday I had also made a large batch of my favorite Refried Black Beans this recipe is included in my Mexican Fiesta Cooking Webinar that is available for purchase. You get to watch me make 10 recipes at one of my in home cooking classes and you get a PDF with all the recipes that you can print! I am getting awesome feedback from people who have purchased the webinar! I took about 3/4 – 1 cup beans (I dont’ measure I just take what looks like a good amount) heated these up to add to the salad. For dressing I used about 1/2 cup or so of salsa – recipe also included in my cooking webinar as well as the juice from 1/2 a lime. 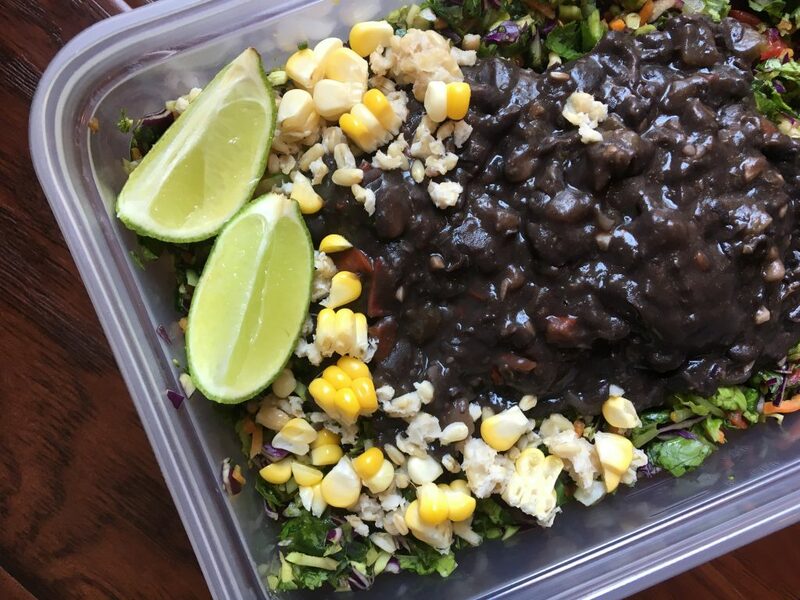 After I took the salad photo – I stirred the chopped salad all together with the beans, corn, oat groats, salsa and lime juice. It was fabulous! I will be making this again and again. Seriously I never get tired of my daily chopped salads. I can make them taste so different from day to day and from season to season. They fill me up for hours and hours! Remember that the quantities are just a suggestion – use as much or as little as you like and sub different ingredients using what you have on hand. Chop the salad vegetables and cilantro until they are the size you prefer. Heat up the refried beans, corn and oat groats – stir them into the bowl of greens along with the salsa and lime juice. Enjoy! I do think this would be perfectly delicious with everything all cold on a hot day. Have you tried a chopped salad yet? What are you waiting for? Get Healthy and Stay Healthy One Plant Based Meal At A Time! When you use my affiliate links to make purchases you support my work here without any extra cost to you. Thank you for your support! Have you checked out my Nutmeg Notebook Amazon Recommendation Page? Here is my Holland Bowl Mill affiliate link. When you make a purchase at Holland Bowl Mill using my link with a $125.00 minimum order you get a free mezzaluna knife! Hi Tami, I somehow stumbled across your site through a FB group I am in. Your info. and recipe looked interesting to me so I decided to “dig deeper” and search out your youtube, FB and blog sites. WOW, am I ever excited that I did!! I LOVE chopped salads and I am just beginning my journey to WFPB eating. You have helped me in more ways than you know with my new eating plan start. I just ordered my chopping bowl and am so excited to get it. I also LOVE the batch cooking you do. Thank you so much for your videos, recipes and helpful tips and insight. I am really looking forward to a new healthy me. Welcome to the wonderful world of plants! I am so exicted for you as this is an amazing journey with so many benefits and rewards. I really appreciate your kind comments and your enthusiasm! Thank you for taking the time to leave me such a lovely comment. I am grateful to be able to pass forward what has worked for me. Getting comments like yours makes it all worth while. I hope to see you here on the blog often. Hi…just ran into your blog and the recipes look awesome. Digestively I have a hard time with salad greens like lettuces, in particular. What do you tend to add to your salad vegetable mix? I just put in some lettuce seeds to see if I can grow my own and avoid whatever it is that wrecks havoc w/ my system. 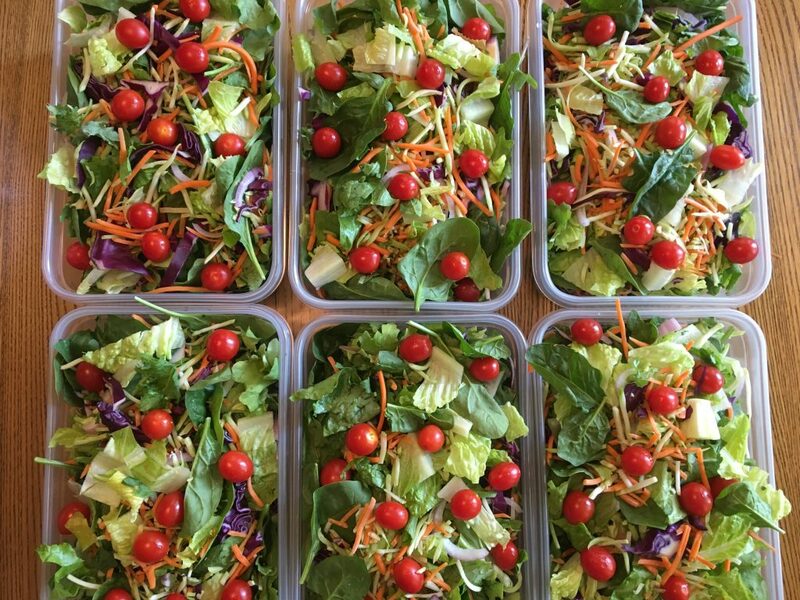 Here is a link to my blog post and video all about my big beautiful salads. It should answer all your questions.